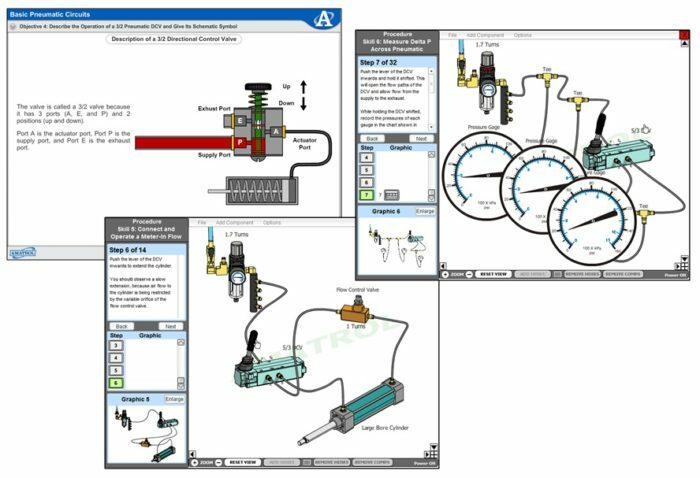 Amatrol’s online Pneumatics training course prepares future workforce members to understand pneumatic applications and concepts and then practice pneumatic skills in a virtual training environment. This pneumatics training course covers key topics and skills in pneumatic power and safety, pneumatic circuits, pneumatic schematics, the principles of pneumatic pressure and flow, and pneumatic speed control circuits. Learners will practice virtual skills like: using a tee to connect two circuit branches together; connecting and operating a single-acting pneumatic cylinder using a 3/2 manually-operated DCV; calculating the retraction force of a cylinder given its size and pressure; and connecting and operating an exhaust port speed control circuit.